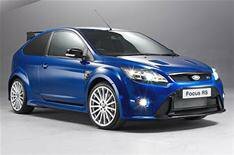 25k pricetag for Ford Focus RS | What Car? Ford's Focus RS will cost from 24,995 when it goes on sale in March. The ultra-hot hatch is powered by a 303bhp 2.5-litre petrol engine that can get the car from 0-62mph in under six seconds, and has an estimated top speed of more than 160mph. Compare that to the 6.8sec time/150mph of the current range-topper, the Focus ST3, which costs 20,408. Features that mark the RS out include the rear, twin-bladed spoiler and the glossy black door mirrors. At the front there are xenon headlights, with LED lights at the rear. Inside, the driver and front passenger sit in Recaro sports seats, with side bolsters matched to the colour of the car. Air-con, a Sony CD changer with DAB digital radio and alarm come as standard, while a 750 luxury option pack adds climate control, automatic headlights and wipers, rear parking sensors and tyre pressure monitor.